Proactive WAN and VoIP monitoring tools for Cisco can help with troubleshooting via an intuitive web interface. Monitors VoIP call QoS metrics, including jitter, latency, packet loss, and MOS. Correlates call issues with WAN performance for advanced troubleshooting of Cisco and Avaya calls. Monitors site-to-site WAN performance using Cisco IP SLA technology. See and pinpoint call problems along the entire network path. Automatically discovers Cisco IP SLA-enabled network devices, and typically deploys in less than an hour. Help ensure that WAN circuits are performing at required service levels by utilizing Cisco IP SLA metrics, synthetic traffic testing, and custom performance thresholds and alerts. VoIP analysis tools can provide deep insight into VoIP call quality metrics, including jitter, latency, packet loss and MOS by examining Cisco and Avaya® call detail records. See and pinpoint call problems across the call path from call initiation, origin to destination, and all network hops in between. Know when VoIP and WAN services are nearing peak capacity. Facilitate capacity planning and measure voice quality in advance of new VoIP deployments by displaying utilization and performance metrics of your VoIP gateway, PRI trunk, and WAN circuits. Get valuable information including up/down status of the SIP trunk, and audio and video call activity. 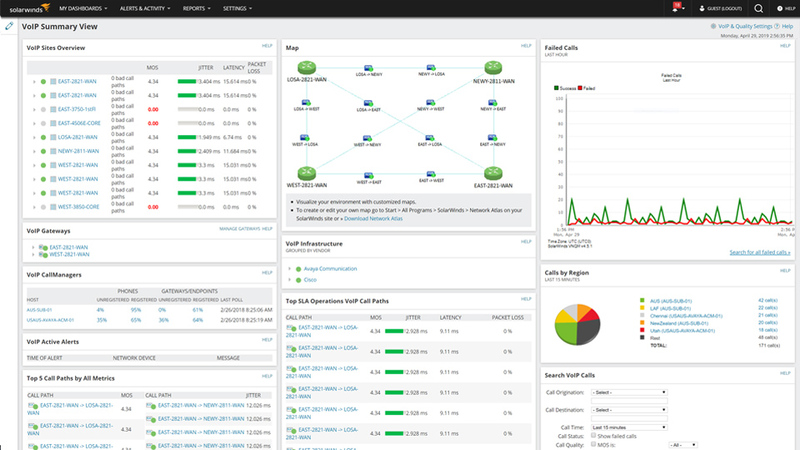 SIP trunk call activity and availability is displayed in the PerfStack™ dashboard, enabling admins to identify the root cause of Cisco SIP call failures by correlating SIP trunk availability, call performance metrics, and corresponding network performance metrics including CPU and memory utilization. Easily enable Cisco IP SLA on your Cisco routers and layer 3 switches. Configure your network to capture detailed WAN performance metrics to help ensure peak performance for VoIP and other network applications with VoIP network assessment tools. Features Overview Proactive WAN and VoIP monitoring tools for Cisco can help with troubleshooting via an intuitive web interface. Where can I find information on installation and customization for my VNQM product? Does SolarWinds offer training or certification for the VNQM product? Our New to VNQM section was created using customer feedback and contains videos, guides, and articles that will help you be more successful with your installation and customization. SolarWinds offers an onboarding assistance program called Smart Start if you are looking for help getting VNQM set up and optimized. 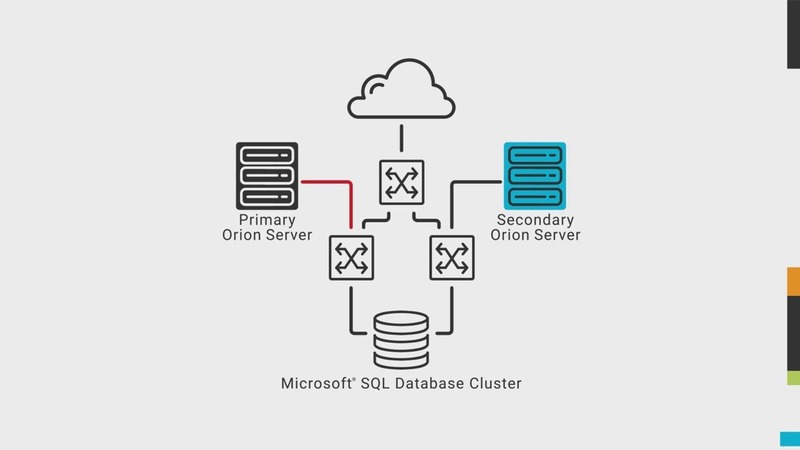 We will provide you with access to one of our implementation experts who will work with you to understand your goals, assist you in installing and configuring your product, and help you optimize your environment for how you need your business to run. VNQM Training section is a single location where you can find e-learning as well as instructor-led classes that will take you from the basics through optimization. We allow you to browse classes or, if you prefer, follow customized learning paths to keep you on the right track. Monitoring VoIP data gives VoIP and network engineers insight into important quality-of-service metrics, like jitter, latency, packet loss, and mean opinion score for gauging call quality. Collect and analyze VoIP performance statistics, including MOS, VoIP jitter, network latency, packet loss, and other important VoIP QoS metrics. To further assist in VoIP monitoring and performance visualization, VNQM allows you to generate synthetic VoIP traffic to monitor network quality when there are no active VoIP calls, so that you can always know and understand your network’s performance. With VNQM VoIP monitoring software, you will also be able to facilitate capacity planning for existing multi-vendor VoIP deployments, measure voice quality in advance of new VoIP deployments, and monitor Cisco IP Telephony (IPT) operations with out-of-the-box support for Cisco CallManager. SolarWinds® VNQM references the Cisco Management Information Base (MIB) to provide out-of-the-box IP SLA monitoring capability for Cisco CallManager and CallManager Express devices. With the use of custom MIB pollers, the VoIP monitoring software can also track the performance of call managers from other manufacturers. VNQM’s VoIP analysis tool can also automatically discover Cisco IP SLA-enabled network devices. VNQM can monitor any node that is relevant to your VoIP network. By expanding the given node trees, you can choose to monitor VoIP traffic down to the interface level. The VoIP network assessment tool can provide a number of default alerts, reports, and resources that allow you to monitor all of your VoIP devices constantly. Additionally, the summary dashboard provides an overview of your entire VoIP network, including resources that present information about VoIP devices, VoIP-related events and alerts, call paths, and overall performance metrics.